Fridays are always the hardest day to dress for — I’ve already worn my favorite looks throughout the week and I usually have plans right after work. I don’t want something too daring for the office, or too stodgy for after! However, this look, with the trendy wide legs pants, a simple, yet playful top and fun accessories will get me by both the boss and the bouncer. 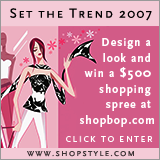 Let your inner stylist run free at ShopStyle with their Set the Trend Contest, or simply go and check out all of the wonderful looks that your fellow fashionistas have created. There’s a plethora of cool looks to help inspire you, whether you want to spice up your work wardrobe or add a kick to your evening wear.